Every body makes money from property in the long run. However, the narrative through the process and at the end is always different. And its often something people gloss over because what is important is that they made money isn’t it? This article, is from a “forgotten PAP supporter” (FPS for short) and sought to warn you and me that if we are thinking about getting our executive condominium (EC), we should think well. Not every one of us will benefit from our government policy and competence. 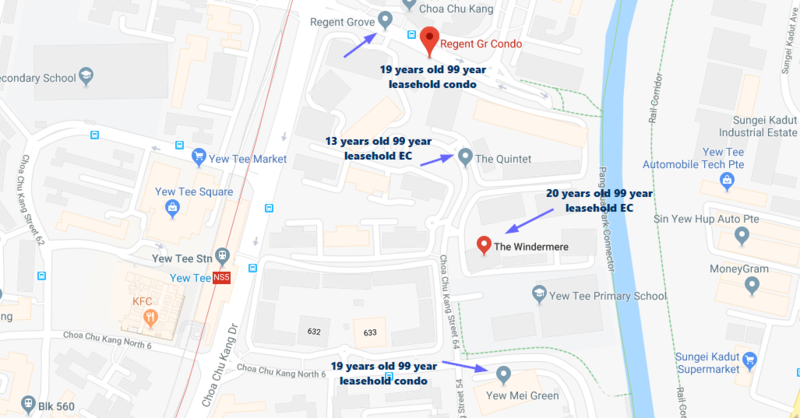 FPS says he was “enticed” by HDB to buy an EC, Windermere in Choa Chu Kang in 1997, which he took possession in 1999. FPS borrowed from his generous boss to pay for the deposit (what a good boss!). FPS reflected that he was ignorant and just dived into it. FPS bought the place for +-S$600,000 and sold it in 2015 for +-S%900,000. In his words, he sold at a very small profit. When he sold, HDB have a share of the proceed because HDB imposed a S$72,000 sale levy back in 1999 when he sold his 5 room HDB flat. Currently he has retired to a studio apartment (SA) with his wife. Buying a resale flat would consume a large part of his retirement fund. He did not manage to get the Silver Housing Bonus (SHB) of $20,000. (Kyith: this might be because the annual value of his private property is higher than S$13,000). The SA is 45 sqm, and according to him zero resale value and cost S$109,000. He can only fund it with cash. He is currently debt free now, have always been prudent with his expenses. He was also able to adjust his lifestyle downwards. What he would like to warn us about is that servicing through this “investment” of his can be quite a challenge. His career is pretty turbulent. He could have went bankrupt had he not gotten an overseas project management posting in 2004. FPS felt that if he had stuck with his 5 room flat bought in 1982, he would be better off. FPS warned that you cannot lose your job, or be unemployed for a long time. Even if you benefit from buying an EC, the benefit would not make you a cash rich millionaire. I am rather glad that FPS was able to see the things that matter more in his life which is, that he is debt free, prudent, very happy with his living conditions, convenient neighborhood and good neighbors. While not in the context of the article, I wish he would share more about living in a studio apartment. 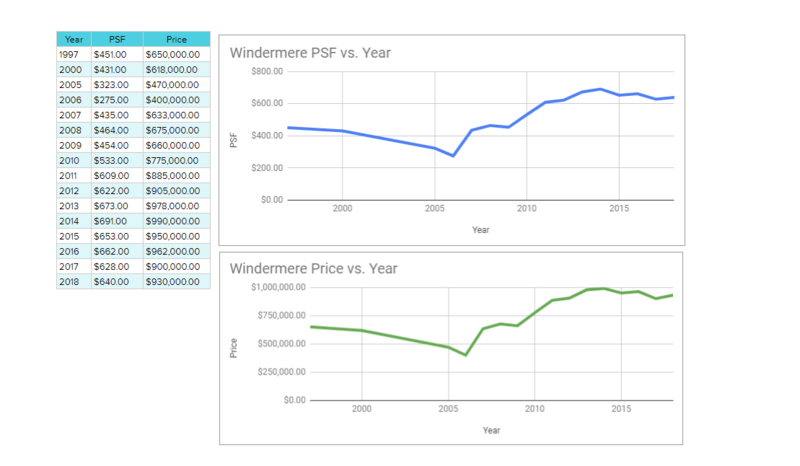 Was Windermere a Poor Investment Money Wise? FPS seemed to think that he might be in a better situation had he stayed in the 5 room flat bought in 1982. I think if you lived through the period where your flat appreciates in value from 1982 to 1997 and compared it to the appreciation from 1997 to 2015, of course the appreciation of the 5 room flat is great. Or he might be of the view that, he would have avoided the financial worry of having to service a large mortgage during the early 2000s. Darius, the CEO of 99.co encouraged me to use some of their analytics tools more and in their condo profile of Windermere EC, you can see almost all the historical transactions for the EC. 99.co have like 31 pages of Windermere transaction data dating back to 1997. Turns out by selling at 2015 for probably around $950,000 odds, FPS didn’t missed out much. It probably took him 12 years to break even in 2009. 2009 is a very interesting year because, it not only coincides with the end of the GFC but a lot of those who bought at the height of 1997 finally managed to break even. If we take into account the $72,000 in levy, and perhaps a conservative $10,000 in furnishing and renovation cost, the cost would be $660,000 and the approximate sale cost after levy is $878,000. The compounded average growth rate (CAGR) for FPS is 1.6%/yr! If we take out the levy, the CAGR is 2.04%/yr. Goodness I was not expecting that kind of CAGR. I think insurance endowment plans and Singapore government bonds yield more than this. It should be noted that, FPS case might be one of the unlucky cases, where he bought when there is euphoria in the property markets. We have also not factored in leverage. In another situation, the internal rate of return (IRR) would make the returns look more respectable. To find out whether staying in a 5 room flat make more sense, perhaps we can compare against the appreciation of a 5 room flat over the same time period. I got lazy, so I thought why not compare against some poor soul who also bought within the same time frame. If I were to compute the CAGR of this flat, its 2.55%/yr over 21 years. Since my parent’s first subsidized flat was sold before Mar 2006, the resale levy for a 5 room HDB flat is 25% of the resale value, or $112,500! Suffice to say, we got to get a resale flat (not much upside), or I got to get a BTO by myself. I look at that CAGR, and I start wondering we are the worst property owners out there. 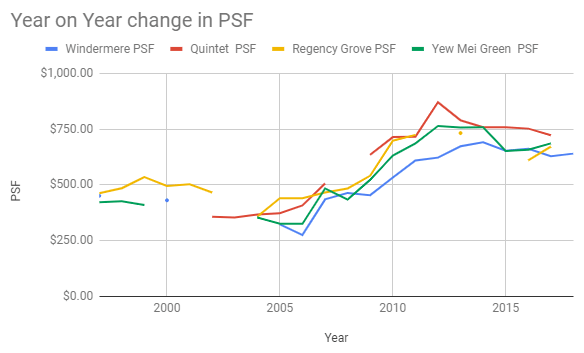 Turns out, some how, my CAGR is actually better than FPS! What we were hoping for is that, by purchasing an EC, it has some characteristics that make it do better than the traditional HDB flat. Its capital appreciation is higher, despite what the economy does. In this case study, paired against my parent’s experience, it shows that it does not exhibit these special characteristics. It turns out, the property market sometimes is pretty similar to the stock market. Mr Market will keep throwing a price out to you. You have to decide whether you want to buy, sell or let it slide. The government can come up with the concept of EC, but it is up to us to evaluate whether it makes a good investment, and whether it is a good investment at this current point. There would be many that have a much happier experience with EC. There would also be many that will snicker and laugh at Kyith’s parents for buying a HDB flat at the worst possible time. When we do not have enough money, our thoughts is more consumed by accumulation. Often, the plan is not so well thought out and in the end, we get very surprised financially, in a negative way. I think many like FPS start out putting their money in an EC, with the hope that the EC appreciates enough to form part of their retirement. However, there is a difference between a lived in property and an investment property that you buy at the side, to complement your lived in property. 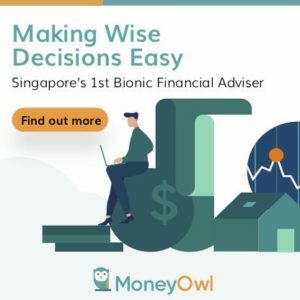 At some point you got to think about what is your plan to cash flow this investment so that you have cash flow for your financial independence. they have no idea what to do with the cash that they realized! The lack of an exit plan or transition is for me a great gap that is not discussed enough. I think more could be shared about having a more holistic financial plan with properties that you lived in. I am not a property investor, and for the property gurus out there, you can provide the more holistic plan. Giving people that idea would shift the conversation to number projections. So since I did the data for one, I got curious to see whether does EC’s value over time approach that of a full fledged condominium. So I see who are Windermere’s neighbors. Turns out its neighbors make pretty good comparisons. All 4 are 99 year leaseholds. All 4 are like equal distances from the MRT station. I picked out a size of Windermere that is pretty big at 1450 sqft, and sought to find something equivalent. The table above shows the sale transactions, as taken from 99.co. Regency Grove’s CAGR for 19 years is 1.99%/yr and Yew Mei’s CAGR is 2.50%/yr. You get almost the same as Windermere. The Quintet gets the best CAGR at 5.37%/yr by virtue of being released at the lowest price. Property is a speculation game. The original title of this article is you can get screwed over even if you didn’t buy an EC. And I think it can be pretty true. You just have to see the similarities between my parents and FPS. Both bought almost at the same time, just that the kind of property is rather different. I am still living in their investment right now, which means that we cannot effectively monetize for their retirement. So in a lot of case, the retirement annuity came from the children. In the end, realizing the gains is not what the end game is about. It is about how much liquid investible assets that you have and how you create a cash flow out of them. And this is often where people fall short of and why we turned to retirement endowment funds. Property in the end will net you a positive gain. One equation that was not mentioned a lot is that, if this have been a buy to let property, then the rate of return would have been boosted by a rental yield. Hi Kyith, thanks for the insightful article on a topic many would have an interest in! 1) Perhaps if the main advantage of EC is the initial discount on purchase price (as with all BTOs really), the CAGR would be more attractive if the holding period was shorter – like how BTO buyers sell after 5 year MOP. It may not be clear in this case though as he was in the red for quite some time. 2) The CAGR computation can be somewhat subjective. Running expenses especially interest will have a significant impact, but a bigger factor would be to compute based on his actual cash contribution, afterall leverage makes property investment attractive (I’m not sure if your statement about IRR refers to this). I don’t think it affects your analysis though as the main point is comparing EC vs others and you’re applying the same assumptions, so I’m nitpicking on a minor point sorry! Would just like to point it out as a “caveat” to using the values to assess whether property investment is good in general. Also as mentioned, on hindsight the timing of his purchase was poor/suay. Your ability to produce quality original writings with deep research all the time astounds me, it seems you’ve found a hack to get 48 hours in a day 😉 Hope to see it going and thanks again! HI KP, i try my best. I wasted enough of my life on this haha. I think if you leverage and compute the return on the cash, it will be higher. Unfortunately we do not know a few of the permutations. You are right that I stated if you have leverage and rented out, return permutation is different. However we got to ask the question, how many with EC rent out in the first 10 years? I think you need to consider your friend 1.6%/yr +Rental income have he rent out. Since he stay in, the amount he saved is equivalent to the rental income. Assuming 3 to 5% rental yields , his returns should be 4.6-6.6% depending on the year..
it makes sense. but some rent some doesn’t. you cannot lived in your other investments. how do we equate things? One property is not an investment is called Liability. Many got their profit and spend it and keep quiet about their spending, their loss they tell the whole World. How many will share how much they profit from property, I guess only me. I have a lot of friends who have made a gain on property. what is it you are trying to get at? Share how profit is made instead of just the loss. At the end of the day, like all financial assets, it’s all about the valuation. For 5-rm BTO and EC, the “market subsidy” is about 10%-20% (discount gets less the more atas the housing). If bought near the highs just before a -40% protracted decline in the general housing index, even a 20% discount will still require some time to recover & break even. Difficult to take advantage of things like valuation or property cycles when you’re talking about your own residential or matrimonial home. Hence the prudent approach is to get an affordable home for living in, and spending the time/effort & building up capital to see if getting an investment property is for you. i had a conversation with my uncle and he thinks those that have bought in 2009 would have sat on a 35% gain. its not wrong. they basically got it at a better timing. Ur uncle is correct. However it also demonstrates the difficulty of doing it in real time. A couple booking their flat in 2009 in preparation for marriage is largely lucky in timing. Someone else who is thinking of upgrading in 2009 would need (1) fortitude in buying when things can still get worse and (2) had confidence the property market would recover in 3-4 yrs time when he sells his current property. Even for investors looking to buy a 2nd property, they were full of doubts. I remember a relative asking me in May 2009 how to know when is the bottom. I just told him to follow URA’s index, whereupon his response was Wah that info so delayed. I said look, we are in the midst of the worst bear market since the great depression — so what if you’re off the absolute bottom by 3 or 5 months?!? He ended up buying only 1.5 yrs later. I guess you would also need to take some risk there is no buts going around that. Usually the best time to invest is when you need to eat in front of a smelly toilet bowl. Property investment is about your ability to hold. If one cannot hold the property during the crash it is call speculating. Never Time the market without doing homework it increases your risk. Remember your “Life Timeline” you don’t have a lot of 10 years. You are bald like one punch man. after 10 years, an EC becomes a full-fledged condo. comparing EC with full-fledged condo in the vicinity is the fairest method. Other things are all personal matters – such as mortgage loan, money going back to CPF. For some may use cash and some me be retirees so money going back to CPF is no issue.